Hosts are expected to provide riders a place to put their tent or motorhome, or a place to sleep inside - access, if possible, to a bathroom and shower and somewhere to fill water bottles. 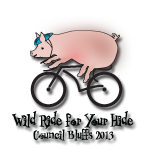 Hosts are not required to transport, feed, provide amenities, or entertain the riders. Hosts are not allowed to charge for these services. Guests who respect your wishes. Someone who will remember your kindness. Whether you want to offer coffee, snacks, a beverage or anything else. RAGBRAI riders will arrive mid to early afternoon on Saturday, July 20th and will leave around 9:00 a.m. on Sunday, July 21st. Join the Fun!!! This is a great opportunity to meet new, fascinating people and to build life-long friendships. *Host will be asked to complete a brief background check through the Council Bluffs Police Department.